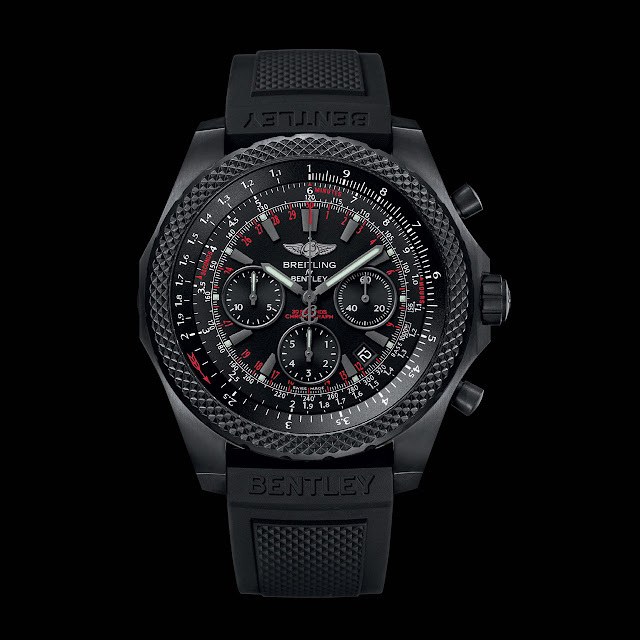 The latest timepiece to carry the Breitling for Bentley name is an ultra-light, ultra-sporty creation, issued as a 1,000-piece limited edition. The all-black exterior of the Bentley Light Body Midnight Carbon conceals a tough but lightweight titanium chassis with a high-resistance, carbon-based treatment. The dashboard-inspired dial features two Breitling exclusives - a "30-second chrono" and a "variable tachymeter" - with red-accented indications. The originality and force of this black-clad design are further emphasised by the mat black hour-markers and hands, and by the rubber strap that takes its knurled pattern from Bentley radiator grilles.